For Electric Sky 2019, our collaborative installations will be oriented around the theme “Bio Zoom”. It will be a year of art, tech and science, as we explore how dramatically changing our perspectives — zoomed in to the most nanoscopic view, or zoomed out to the most galactic, transforms even the most mundane objects into beautiful works of art. For our group installations, we provide a basic framework around the theme, and then recruit artists, technologists, scientists, and designers to take on aspects of that theme, playing with technologically-infused, sensing, interactive and self-illuminated sculptural elements. This year our theme is BioZoom, and we invite you to explore how changing perspectives –whether through a microscope or a telescope — exposes the beautiful, abstract, often fractal, repeating patterns of the universe. In the style of hackathons, you may bring your own piece to work on, you may join another emergent collaboration, or you may just show up to enjoy the show. Participating artists and technology creatives may include light, sound, video, performance, landscaping, architectural elements, in addition to visual art, however all projects should incorporate an electronic, sensing, interactive, or self-illuminated component. If you are excited by the idea of creating an individual or collaborative project around our theme “Bio Zoom” but do not have the funds for tickets or material supplies, we invite you to apply to be a supported participating artist or creative technologist, to receive free tickets and funds up to $200 to support your project. Participating artists and technology creatives may include visual art, sound, video, performance, landscaping, architectural elements, and so forth, however all projects should incorporate an electronic or interactive component consistent with the theme. Learn more about our requirements and find instructions to apply here. Application date is April 30th, 2019. We structure the Electric Sky event and our BioZoom collaboration experience to further our goals of a) fostering multi-disciplinary art and tech community in the Pacific Northwest, and b) accelerating the unexpected innovation that evolves through interdisciplinary work. Recruiting and calls for participation in the collaboration will start in early February, and planning will continue throughout the summer, ending with our on-site collaboration in the Electric Sky creativity lab the Thursday-Sunday of the event. As a part of helping artists learn how to use technology in their works, we will host at least one evening how-to workshop (controllable LEDS, sensors, laser cutters) in a maker space in Seattle and a community center in Skykomish in the Spring of 2019. The installations will be completed by Saturday at sunset, at which point it will be open to the public. Following the event, we also hope to reach a larger audience through events such as Lusio and Arts-a-Glow, as we have the past years. 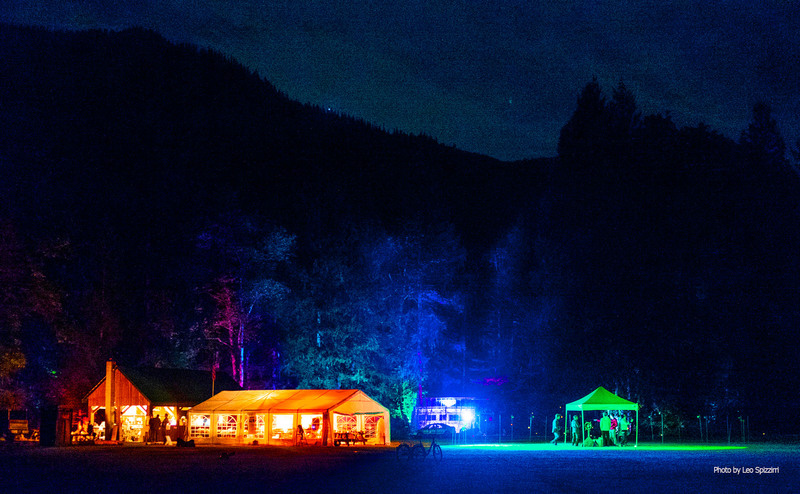 In collaboration with the nonprofit community tech organization Third Place Technologies, we host Electric Sky, an art and tech weekend retreat bringing together artists, technologists and other interested parties to collaboratively engage with each other in new and exciting ways. This event is a cross between an artists’ retreat and a hackathon, with the goal of fostering interdisciplinary creativity and collaboration in an inspiring environment, leading to new, generative work. 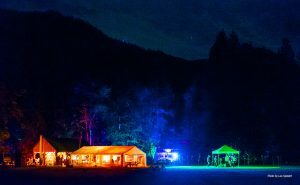 It is held in the Skykomish Ball Park, a softball field an hour and half northeast of Seattle on highway 2, in the middle of the woods, on the Skykomish River, sandwiched between two national forests. Since 2014, over a hundred people have participated each year, an unusual mix of Seattleites and Skykomish locals, with about 25% of the attendees being under 18 years of age. We have a 24 hour Creativity Lab, a madhouse of electronics, laptops, Arduinos, CNC routers, LEDS, lasers, and 3D printers, mixed with a more traditional array of art supplies. To facilitate team formation and community building we start the event with a round of introductions and project pitches, have one large group meal, and finish the event with our group installation (The Luminous Garden in 2016, and The Wondering Woods in 2017, and the Digital Frontier in 2018), at an opening party that is open to the public. Brought to you by Third Place Technologies in collaboration with Totally Legit. and funded in part by 4Culture.